Apparently having NOT learned a lesson from the lack of success for the IDW Comic Books, Topps decided to release their own Comics and sell them directly from their website. (COMING SOON) This page provides a comprehensive look at Garbage Pail Kids Topps Comics #1, from advertising all the way to production. You can even flip through the entire comic book right here at geepeekay! Enjoy! Ever since Topps achieved success with their online exclusive offerings, their promotional efforts leave a little to be desired. Aside from an Email sent out to subscribers, and a Facebook post advertising the Comic, there wasn't really anything else out there to promote the product. 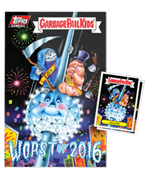 GPK is ringing in the New Year by highlighting the worst of 2016! 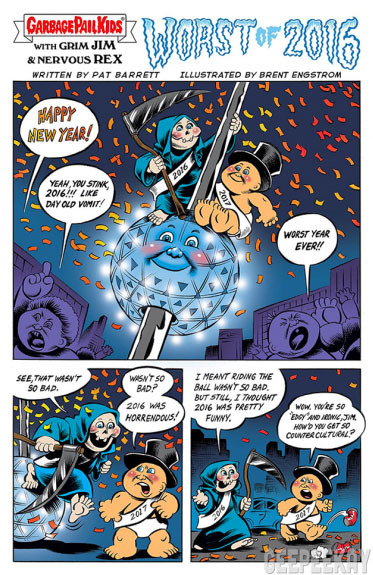 Follow classic GPKs “2016 Father Time” Grim JIM and “2017 Baby New Year” Nervous REX as they take a look back at the worst that 2016 had to offer! (COMING SOON! For now I have just included a sample page from the Topps website) Now that you know HOW Comic #1 came to life, why not read it!? That's right, you can flip through hi-res scans of the entire WORST OF 2016 below! Well…what are you waiting for...start reading!